For the record – 4 gallons of strawberries is a lot of strawberries. I had to find a way to use them and lots of them. What could be better than Strawberry Jam. One problem, I have never canned anything in my life. What is one to do but search the internet. It is full of tips and makes it seem so easy. I decided I was up to a challenge and conquered the fear of making jam with a lot of success I might add. 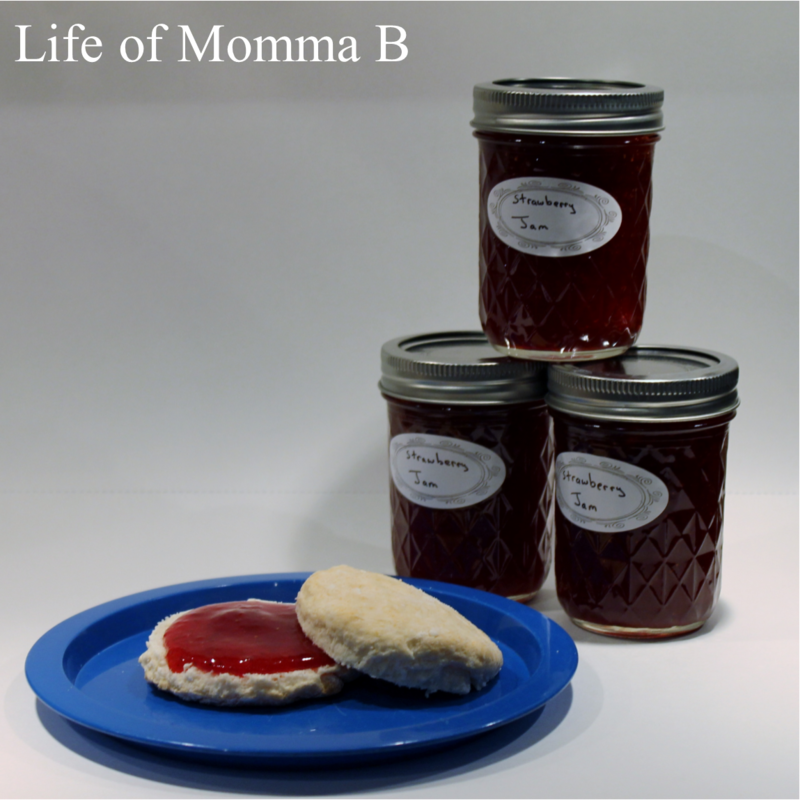 After reading a dozen plus websites I found The Pioneer Woman’s Canning 101 and Strawberry Jam blog entry (here). I read her posts multiple times. And made a few changes so here we go. Begin by cleaning a batch of strawberries and smashing them with an immersion blender. Now measure the strawberries and add them to a pot with the lemon juice and pectin. Stir until well combined then add butter. Bring to a boil. Then add sugar and return to a rolling boil. Allow to boil for 1 minute. Then remove from heat. Use a spoon to remove any foam that has formed on the top. Pour jam into warm jars, that have been sterilized, leaving a 1/4 inch head space. Add jar lid and ring and submerge in a large pot of water. Cover with water and bring to a boil. Boil 12 minutes, then remove from heat and allow to sit in the hot water for 5 additional minutes. Remove jars and allow to cool. Once they have cooled check to ensure the seals. NOTES: The immersion blender gave me less chucks of fruit than I intended but it works great (a food processor would also work). The final jam was a little on the sweet side so next time I will reduce the sugar added, but don’t worry it was still good and my family cannot get enough. The butter is supposed to reduce the amount of film that forms during the boiling stage. This entry was posted in Recipes and tagged canning, jam, printable, recipe card, strawberries. Bookmark the permalink.